Did you know Frontier RTP has a partnership with Bee Downtown? You have probably driven past our hives many times without realizing all of the greatness inside. Some of that greatness has been turned into a honey beer by our friends at Bombshell Beer Company. If you haven't had a chance to give it a try yet, be sure to stop by a Frontier RTP Happy Hour (every Thursday, except the 3rd, from 4:30-6:30pm) and give it a try before it is gone! 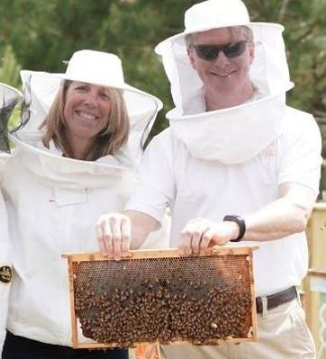 If you want to get a closer look at the bees who make it all possible, join us May 20 to learn more about our hives, its workers, and beekeeping in general from the experts at Bee Downtown. We will start out at the blue picnic tables in front of 600 Park Offices Drive and chat over a quick bite to eat. Then, we will get a tour of the hives from our very own beekeeper. A light lunch will be provided, but please bring your own water bottle for the tour. Fine Print: We encourage folks to bring a water bottle for the tour; it may get hot out there! You must wear closed toed shoes. Long pants and long sleeve shirts are recommended, but not required. We will provide everyone with bee suits and gloves ... safety first!